In the last two decades, the treatment of IBD has been revolutionized by the introduction of biologic therapies; however, their use is associated with high costs and access to these agents varies among countries. One possibility to reduce costs and increase access is the use of biosimilars. The price of the available biosimilar of infliximab (CT-P13) is from 30% to 60% lower than the original product, which provides the potential for cost savings and/or increased access. CT-P13 was approved by the European Medicines Agency (EMA) in 2013, Canada in 2014 and the U.S. Food and Drug Administration (FDA) in 2016. Data have quickly accumulated with this agent in IBD. Development and approval of additional biosimilars is ongoing. Gastroenterologists will be increasingly faced with decisions regarding choice of initial agent, non-medical switching and interchangeability. Therapeutic algorithms and positioning of old and new biologics will become more complex with the advent of the biosimilar era. This review will summarize data from real-life IBD cohorts and an international, randomized, controlled trial in Crohn’s disease (CD) with CT-P13, including data on switching from the originator to the biosimilar. It will also discuss the current biosimilar landscape in Canada and speculate about what the future holds for biosimilars in IBD. Figure 1 shows the pooled response and remission rates from these studies. These rates are in the range of what one might expect with anti-TNF therapies in CD and ulcerative colitis (UC). There were no new safety or tolerability concerns identified by the authors of the meta-analysis. One additional study of interest published after the above meta-analysis is a report of one-year data from the Hungarian nationwide, multicenter, observational cohort. (2) The study was designed to examine prospectively the efficacy and safety of CT-P13 in the induction and maintenance treatment of CD and UC. The cohort includes 353 consecutive IBD patients (209 CD and 144 UC). The proportions of patients who had previously received an anti-TNF agent were 23.4% in CD and 19.4% in UC. Approximately 60% of CD patients and 51% of UC patients were also receiving azathioprine at baseline, while 43% of the CD cohort and 65% of the UC cohort were on systemic steroids at baseline. At weeks 14, 30 and 54 the rates of response were 86.1%, 81.2% and 65.4% for patients with CD. Remission rates in this group at the same time points were 49.33%, 53.4% and 47.8%. Among those with UC, week-14, -30 and -54 response rates were 73.6%, 65.8% and 49.5%. For remission at the same intervals, the rates among patients with UC were 55.7%, 41.0% and 43.0%. Across these groups and time points, clinical efficacy was consistently lower among those groups with prior anti-TNF exposure. In addition to the accumulated evidence for CT-P13 as induction therapy, there is also a growing evidence base for switching to this agent from originator infliximab. The systematic review and meta-analysis mentioned above included six studies evaluating such a switch, although the numbers of patients were quite small. (1) The pooled rates of sustained response and remission at weeks 30–32 and weeks 48–63 are shown in Figure 2. Based on these small numbers, the authors concluded that it would appear that switching is efficacious and safe, but acknowledged the limitations of the small sample size. A prospective controlled study evaluated the switch from originator infliximab to CT-P13, but was not specific to IBD. The NOR-SWITCH study was a 52-week, prospective, non-industry-funded study conducted in Norway. (5) It included a total of 482 patients with various chronic inflammatory diseases (rheumatoid arthritis, spondyloarthritis, psoriatic arthritis, CD, UC and plaque psoriasis). This included 155 patients with CD and 93 with UC. The primary endpoint of the trial was disease worsening over 52 weeks, defined in different ways for each of the conditions in the study. For CD, it was defined as an increase in HBI of ≥4 points and a HBI score of ≥7 points; for UC, it was defined as an increase in p-Mayo score of ≥3 points and a p-Mayo score of ≥5 points. For the overall cohort, the proportion with disease worsening was not significantly different between those randomized to switch to CT-P13 (30% worsened) and those continuing on originator infliximab (26% worsened). Although the absolute difference was greater for the subjects with Crohn’s disease, this difference was not significant and additional exploratory analysis have not confirmed different effect in this subgroup. (6) There were no significant differences reported in efficacy, safety or immunogenicity between switching and remaining on originator infliximab. The landscape of biosimilars: where are we now? Data from 2015 showed that biologic medication accounted for approximately 10% of all pharmaceutical sales in Canada. (7) As such, the successful integration of biosimilars into practice potentially represents a huge opportunity to reduce drug spending. In principle, this could free up additional funding for new innovative medicines or other healthcare priorities. The biosimilar experience to date has only been a hint of things to come. There are many more agents that are either under consideration for approval or that are in late-stage development. This includes many more biosimilars of infliximab as well as many biosimilars of adalimumab. (11) The possibility of having many different biosimilars for the same originator also raises the concern of interchangeability among these options, not just in relation to the originator product, but to each other as well. This issue has not yet been addressed in any evidence-based manner, but is a question that will need to be answered in a multiple-biosimilar environment. Biosimilars can help address health care affordability and patient access to effective medications. A significant amount of clinical data and real-world experience has accumulated with the infliximab biosimilar CT-P13, the first to be approved in Canada and around the world. Efficacy and safety data with this agent have demonstrated similarity to the originator agent, and confidence and experience are growing. Forthcoming challenges in the biosimilar area include the impact of multiple switches with different biosimilars of the same originators, in terms of suitability of non-medical switch and interchangeability, and positioning older and newer biologics in the current treatment paradigm. Bruce is a 45-year-old, part-time factory worker and artist. Six months ago, he presented with bloody diarrhea and was diagnosed with moderately active ulcerative pancolitis. For the last four months, he has been steroid-dependent and unable to taper below 15 mg of oral prednisone PO daily without relapse. You recommend a change in therapy. Selecting a particular therapy from among the approved biologics for UC should be a collaborative process between the physician and the patient, taking into account any particular preferences and characteristics that might make one agent more appealing than the others. You discuss all options. Bruce recalls that his cousin takes infliximab for arthritis and had a good experience. He wishes to do the same. His public drug plan rejects your application for the innovator product and will only fund a biosimilar. In Canada, the only biosimilar of infliximab currently available is Inflectra (also known as CT-P13 and Remsima). (13) The registration studies done with this agent were done in rheumatoid arthritis. There were no significant efficacy or safety differences noted between the originator (Remicade) and the biosimilar. (13) A head-to-head comparison of Inflectra vs. Remicade in CD has been presented in abstract form. 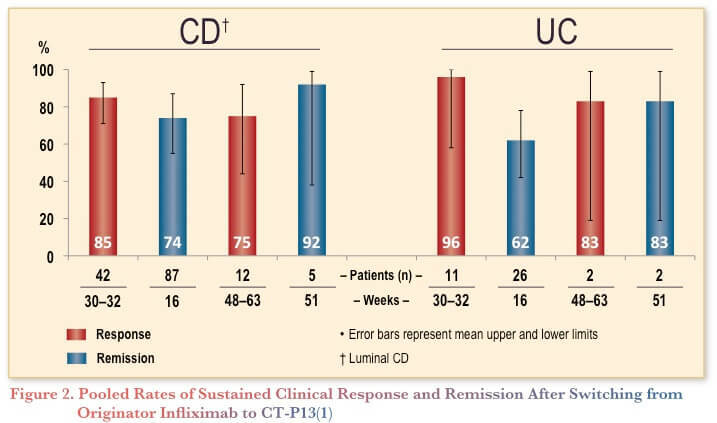 (3,4) While the originator product has been well studied in major prospective, randomized clinical trials in UC, there have been no published RCTs in UC using this or any other infliximab biosimilar. There have, however, been several real-life studies (2,14–22) and two systematic reviews(1,23) published documenting the effectiveness and safety of Inflectra in IBD. These include use as initial biologic therapy and among patients switched from the originator infliximab. All the studies reported excellent effectiveness and safety of the biosimilar, with no findings that would be considered surprising compared to the originator infliximab. There was one study that reported altered infliximab levels after switching from originator to biosimilar,(15) but this is not relevant to the current case scenario. While the best evidence for infliximab use in UC is undoubtedly with the originator compound, there has been no suggestion to date that the biosimilar Inflectra has been any less effective, nor have there been any safety signals. If the patient is content to use a biosimilar, there is no compelling argument to be made against this option. However, there are also other options you could consider, including appealing to the insurer for access to the originator, prescribing a subcutaneously administered anti-TNF agent instead or going outside the class to prescribe vedolizumab. The patient’s common-law wife is a postal worker with private drug coverage. After some negotiation, the support service for the innovator company manages to secure reimbursement for Bruce’s therapy. He starts on infliximab as monotherapy and does well. Six months later and after five infusions of infliximab, his partner’s insurer announces that it has changed its policy and will no longer reimburse the innovator biologic. The patient will need to switch to the biosimilar. The NOR-SWITCH study involved a subgroup of patients with IBD. (6) This well designed, arms-length (funded by the Norwegian government) study reported that switching to the biosimilar was not inferior to continuing on the originator infliximab in terms of disease worsening or rates of adverse events. The evidence does appear to show that switching is a viable option at this point. If Bruce is doing well on infliximab and his only option for continued infliximab therapy is the biosimilar, this is a reasonable choice. However, switching to another anti-TNF or vedolizumab is also a viable option if this is his preference and he can secure funding. You appeal to the insurer, but they are unwilling to compromise. Bruce agrees to switch to biosimilar infliximab. The support service offers routine therapeutic drug monitoring (TDM), and you find out that Bruce has a trough level of 1.2 mcg/mL. Thankfully, he continues to do well and remains in clinical and biochemical remission. At his six-month follow-up appointment, he tells you he is now working full time for an automobile parts manufacturer and will have a new drug plan in three months. One of his co-workers was just started on innovator infliximab, and Bruce finds out it is listed on his new insurer’s formulary. He asks if he should switch back. This is a situation with very little data available to guide us. While there is a growing amount of data documenting the feasibility of a switch from originator to biosimilar infliximab, the same is not true for the reverse. He is currently doing well on the biosimilar despite low serum infliximab levels. Research has shown that remission rates are higher for patients with higher drug levels,(24) so one might consider it prudent to increase the dose of the biosimilar infliximab if he opts to stay on that treatment. Komaki Y, Yamada A, Komaki F, et al. Systematic review with meta-analysis: the efficacy and safety of CT-P13, a biosimilar of anti-tumour necrosis factor-α agent (infliximab), in inflammatory bowel diseases. Aliment Pharmacol Ther. 2017; 45(8):1043–57. Gonczi L, Gecse KB, Vegh Z, et al. Long-term Efficacy, Safety, and Immunogenicity of Biosimilar Infliximab After One Year in a Prospective Nationwide Cohort. Inflamm Bowel Dis. 2017; 23(11):1908–15. Kim YH, Ye BD, Pesegova M, et al. Phase III randomised, double-blind, controlled trial to compare biosimilar infliximab (CT-P13) with innovator infliximab in patients with active Crohn’s disease: early efficacy and safety results. Presented at ECCO 2017; Abstract #DOP061. Kim YH, Ye BD, Pesegova M, et al. 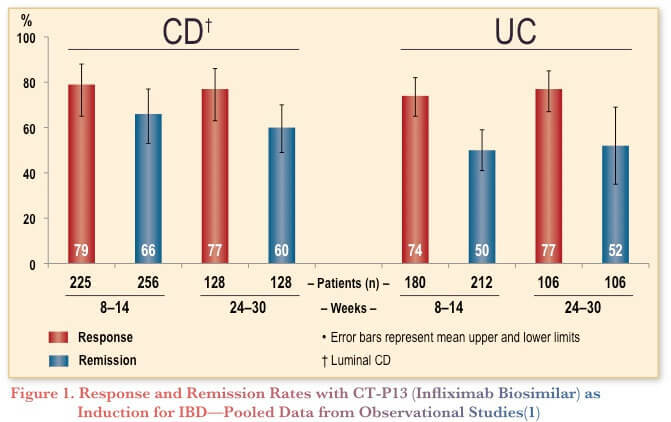 Phase III randomized, double-blind, controlled trial to compare biosimilar infliximab (CT-P13) with innovator infliximab (INX) in patients with active Crohn’s disease: early efficacy and safety results. Presented at DDW 2017; Abstract #248. Jørgensen KK, Olsen IC, Goll GL, et al. Switching from originator infliximab to biosimilar CT-P13 compared with maintained treatment with originator infliximab (NOR-SWITCH): a 52-week, randomised, double-blind, non-inferiority trial. Lancet. 2017; 389(10086):2304–16. Market Intelligence Report: Biologic response modifier agents, 1st Edition. IMS MIDAS Unit Sales data by month (March 2017). Rencz F, Gulácsi L, Péntek M, et al. Cost-utility of biological treatment sequences for luminal Crohn’s disease in Europe. Expert Rev Pharmacoecon Outcomes Res. 2017; 17(6):597–606. Danese S, Fiorino G, Raine T, et al. ECCO Position Statement on the Use of Biosimilars for Inflammatory Bowel Disease-An Update. J Crohns Colitis. 2017; 11(1):26–34. Gecse KB, Lakatos PL. IBD in 2016: Biologicals and biosimilars in IBD – the road to personalized treatment. Nat Rev Gastroenterol Hepatol. 2017; 14(2):74–6. Bressler B, Marshall JK, Bernstein CN, et al. Clinical practice guidelines for the medical management of nonhospitalized ulcerative colitis: the Toronto consensus. Gastroenterology. 2015; 148(5):1035–58. Celltrion Healthcare Co. Ltd. Inflectra Product Monograph. Date of Approval: June 10, 2016. Tursi A, Allegretta L, Chiri S, et al. Effectiveness and safety of infliximab biosimilar CT-P13 in treating ulcerative colitis: a real‑life experience in IBD primary centers. Minerva Gastroenterol Dietol. 2017; 63(4):313–8. Eberl A, Huoponen S, Pahikkala T, et al. Switching maintenance infliximab therapy to biosimilar infliximab in inflammatory bowel disease patients. Scand J Gastroenterol. 2017; 52(12):1348–53. Argüelles-Arias F, Guerra Veloz MF, Perea Amarillo R, et al. Switching from reference infliximab to CT-P13 in patients with inflammatory bowel disease: 12 months results. Eur J Gastroenterol Hepatol. 2017; 29(11):1290–5. Farkas K, Rutka M, Ferenci T, et al. Infliximab biosimilar CT-P13 therapy is effective and safe in maintaining remission in Crohn’s disease and ulcerative colitis – experiences from a single center. Expert Opin Biol Ther. 2017; 17(11):1325–32. Smits LJ, et al. Long-Term Clinical Outcomes After Switching from Remicade® to Biosimilar CT-P13 in Inflammatory Bowel Disease. Dig Dis Sci. 2017; 62(11):3117–22. Razanskaite V, Bettey M, Downey L, et al. Biosimilar Infliximab in Inflammatory Bowel Disease: Outcomes of a Managed Switching Programme. J Crohns Colitis. 2017; 11(6):690–6. Buer LC, Moum BA, Cvancarova M, et al. Switching from Remicade® to Remsima® is well Tolerated and Feasible: A Prospective, Open-label Study. J Crohns Colitis. 2017; 11(3):297–304. Fiorino G, Manetti N, Armuzzi A, et al. The PROSIT-BIO Cohort: A Prospective Observational Study of Patients with Inflammatory Bowel Disease Treated with Infliximab Biosimilar. Inflamm Bowel Dis. 2017; 23(2):233–43. Kolar M, Duricova D, Bortlik M, et al. Infliximab Biosimilar (Remsima™) in Therapy of Inflammatory Bowel Diseases Patients: Experience from One Tertiary Inflammatory Bowel Diseases Centre. Dig Dis. 2017;35(1–2):91–100. Radin M,Sciascia S, Roccatello D, et al. Infliximab Biosimilars in the Treatment of Inflammatory Bowel Diseases: A Systematic Review. 2017; 31(1):37–49. Roblin X, Boschetti G, Duru G, et al. Distinct Thresholds of Infliximab Trough Level Are Associated with Different Therapeutic Outcomes in Patients with Inflammatory Bowel Disease: A Prospective Observational Study. Inflamm Bowel Dis. 2017; 23(11):2048–53. Kelly OB, Donnell SO, Stempak JM, et al. Therapeutic Drug Monitoring to Guide Infliximab Dose Adjustment is Associated with Better Endoscopic Outcomes than Clinical Decision Making Alone in Active Inflammatory Bowel Disease. Inflamm Bowel Dis. 2017; 23(7):1202–9. Mitchell RA, Shuster C, Shahidi N, et al. The Utility of Infliximab Therapeutic Drug Monitoring among Patients with Inflammatory Bowel Disease and Concerns for Loss of Response: A Retrospective Analysis of a Real-World Experience. Can J Gastroenterol Hepatol. 2016; 2016:5203898. Liefferinckx C, Minsart C, Toubeau JF, et al. Infliximab Trough Levels at Induction to Predict Treatment Failure During Maintenance. Inflamm Bowel Dis. 2017;23(8):1371–81. Mitrev N, et al. Review article: consensus statements on therapeutic drug monitoring of anti-tumour necrosis factor therapy in inflammatory bowel diseases. Aliment Pharmacol Ther. 2017; 46(11-12):1037–53.